STRATOVARIUS, the top name in the melodic power metal scene, are back with a new album — and some fresh and very rare material! 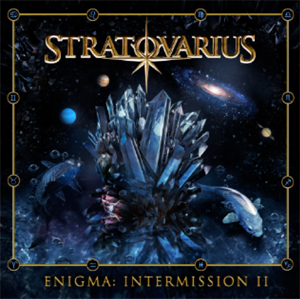 ENIGMA: Intermission 2 features three brand new songs, as well a four beautifully arranged orchestral versions of popular STRATOVARIUS songs. The album is similar in concept to Intermission, released 17 years ago between Infinite and Elements. The sense that these seven tracks made in 2018 are completed by nine very rare, very hard to find power metal gems. With over 30 minutes of brand new material and 50 minutes of previously rare metal, ENIGMA: Intermission 2 is definitely more killer than filler! Take "Enigma" and "Oblivion", for example. Those are fresh from the studio in 2018. Both combine an epic melody with a bombastic chorus and heavy riffs for STRATOVARIUS' trademark sound and remind of the listener of "Unbreakable" from their 2013 album Nemesis. "Unbreakable" is the most streamed song in the band’s history. There's also "Kill It With Fire" and "Castaway", two epic and full-blown power metal tracks that were previously only available to Japanese fans. Check out the stream for "Oblivion" below. The sweeping melodic power metal grandeur of STRATOVARIUS, together with Timo Kotipelto's powerful yet emotional voice is very much present on all of the 80 minutes of this release. This spirit truly makes ENIGMA: Intermission 2 closer to a full new studio album than to a mere compilation. The album is will be released September 28 via earMUSIC.